Philadelphia favorite Han Dynasty has now graced our good ole city. This brand new Chinese joint specializing in Szechuan cuisine has opened in the East Village, and it is quite great. I stopped in last week and had some delectable tastes. Dan Dan Noodles ($7.95) are amazing an pure perfection. Order them. 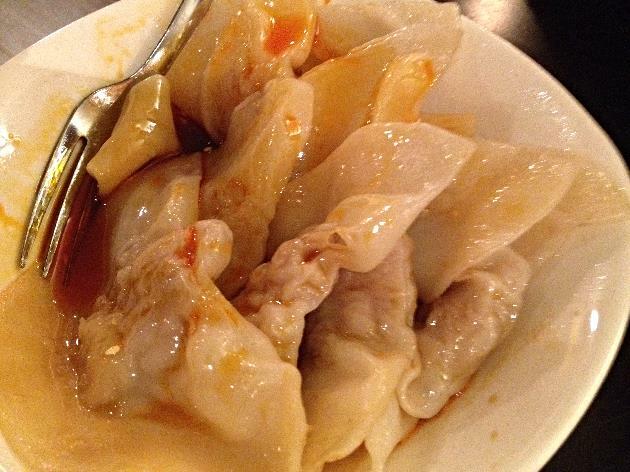 Dumplings in chili oil ($6.95) are delicious. Beef and tripe in chili oil ($9.95) is quite excellent too. Giving you that great Szechuan heat. Dry Pepper Chicken Wings ($9.95) surely hit the spot. You can get your entree at Han Dynasty in 14 different styles of cooking. I think this is quite awesome. Dry Pot Style, we got with lamb ($17.95), and is served in a mini wok and cooked in a spicy hot sauce with black mushrooms, bamboo shoots, bell peppers, and sichuan peppercorns. It was wonderful. Shrimp we had Salt n' Pepper style ($19.95), and it was fabulous. For those of you who can't handle the heat, you can try Han Dynasty's Crispy Rice Style entree, we got ours with chicken ($12.95). It's a sweet and sour sauce with bamboo shoots, black mushrooms, and wood ear mushrooms, served on a pillow of sizzling crispy rice. Our rice was neither crispy nor sizzling, and the dish was a tad too sweet for me. But, if you are looking for an escape from spice and heat, it would suit you just fine. I really enjoyed my meal at Han Dynasty, and I am looking forward to going back. I think the main reason Han Dynasty is a success has a lot to do with it's owner, Han. He was at the restaurant when we dined last week, walking around, talking to tables. He reminded me of another great host and owner, Francesco, from Antica Pesa in Brooklyn. These owners are making dining experiences better for their customer. For instance, when my tablemate stated he didn't love the beef and tripe appetizer to Han, Han asked us if he could try it! Now, never in my history of dining has an owner actually cared that much, where he wanted to try the dish in front of us. We obliged, and he stated it needed more salt. And 5 minutes later a new beef and tripe dish came out for us, with a tad more salt in it. And you know what? It was a better dish. Han Dynasty is a welcome addition to the East Village. New York City welcomes you. Bring the heat.